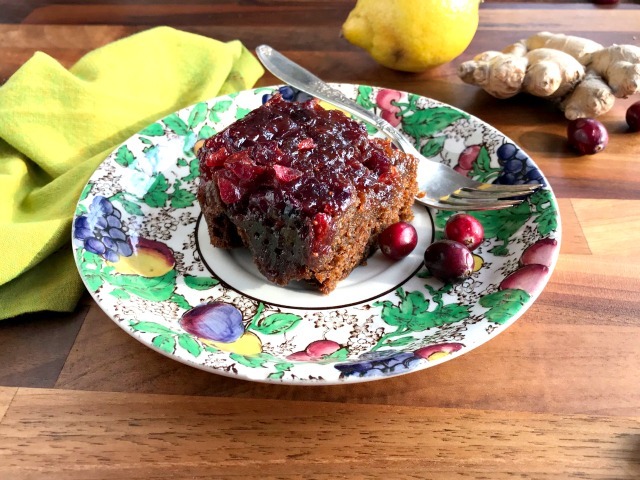 Upside down Cranberry Gingerbread Cake is a sticky gingerbread with a gorgeous red crown. This recipe is a country fair winner from Thunder Bay, Ontario. November is gingerbread month in our house. The comforting flavours of gingerbread seem to suit the damp chilly days between Thanksgiving and Christmas and when the weather turns chilly a beautifully spiced gingerbread can feel cozy and comforting. 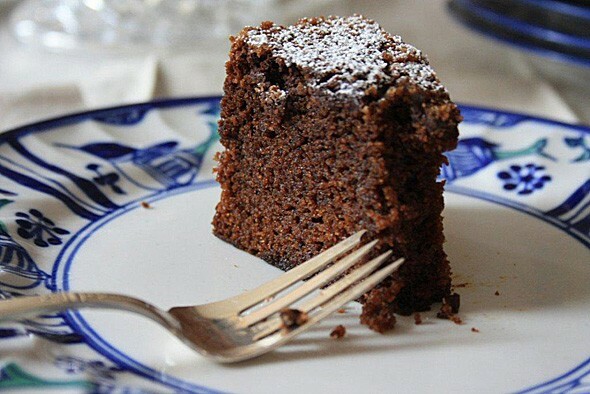 Gingerbread is the sort of cake I almost always serve to guests and bring to potlucks. It’s always a crowd favourite and is the perfect option if you want to bake dessert a day or two ahead of time. The original recipe calls for fresh ginger and cranberry juice. Both can be substituted with great success (see recipe for details). This recipe won first place at the 2018 Hymers Fair in Thunder Bay, Ontario. Congratulations (and thank you) to T. Logan. *Can use any fruit juice, or water. **Can replace fresh ginger with 1 1/2 tsp. dried ginger (add with other spices). Line an 8”x 8” baking pan with parchment paper. Spread chopped cranberries in bottom of pan. In a medium saucepan, melt butter and add remaining topping ingredients. When smooth, remove from heat and pour over cranberries. Use a spoon to evenly distribute. In a large bowl, cream remaining butter with remaining brown sugar, honey, and molasses. Stir in cranberry juice and lemon zest. In a separate bowl, stir together flour, baking soda, and spices. Stir into batter then stir in egg. Spread batter over cranberry mixture in pan. Bake 30 – 40 minutes until cake begins to pull away from the sides of the pan. Cool 15 minutes then turn onto a plate. This looks absolutely delicious. Does it freeze well? Hi Kelli, I’d be hesitant to freeze this cake because I’m not sure what would happen with the cranberry mixture through the thawing process.